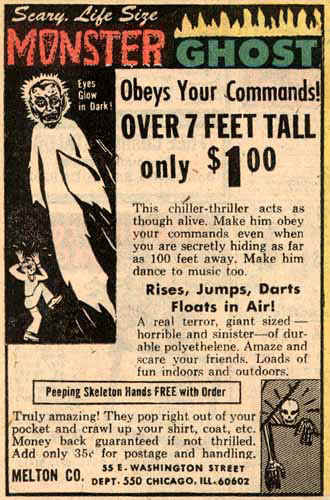 When I was a kid, I saw this ad in a comic book and sent away for a “Life Size” (what kind of non-sense does that make?) Monster Ghost. The promise that it OBEYS YOUR COMMANDS was the real hook for me. If I had been a little older, I might have wondered if the Monster Ghost had a sister, but the best scenario I could envision was maybe I would be chilling outside on a lawn chair, and I could dispatch my undead butler to the kitchen to bring me a Coke. I had five brothers and three sisters, soft drinks went fast around the joint… but who was going to take the last sweet can of sugared water away from a towering creature of the netherworld? Nobody, that’s who. I allowed the four-to-six weeks for delivery, looking forward to my reign as Slave Master of the Dead.